F-Secure is a well known name in computer security. Recently every security company have introduced many security layers to their products. F-Secure have also did the same. 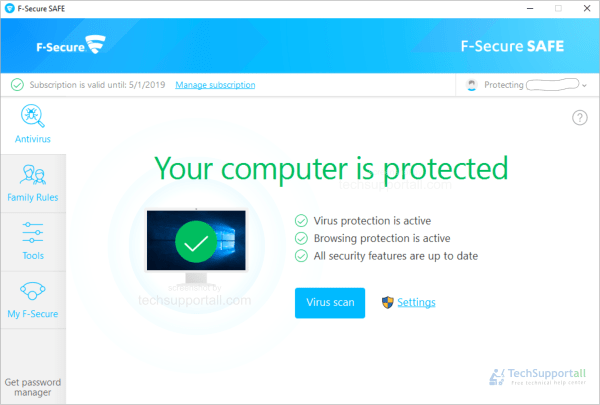 Apart from the traditional antivirus and internet security products F-Secure have launched 2 main product bundles F-Secure Safe and F-Secure Total. To download F-Secure Safe or Total you need to first register on their website. Process is very simple. After registering and log in. Click on apps that you want to install on the device. You can manage all your devices from anywhere using this account. F-secure total comes with 3 apps Safe, Freedome and Key. F-secure safe – It is internet security software with multi device support, it can be installed on any device Windows, Mac, Android etc. 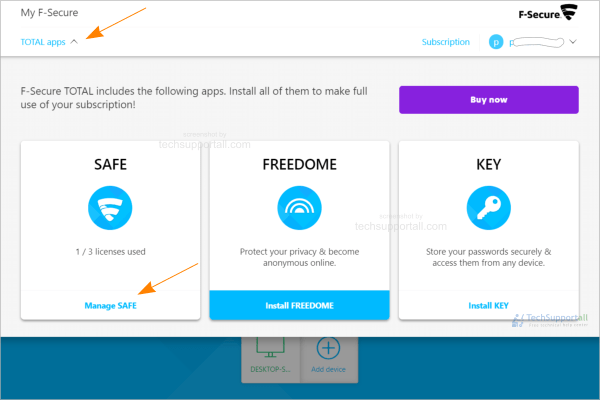 F-secure Freedome – It is a VPN service to browse internet anonymously. It helps in privacy protection. F-secure Key – It is a password manager to save passwords securely and login websites without remembering login information. It can be used on any device. Click on apps toggle and install the desired app i.e F-Secure Safe. It will download an installer file. Run this file. And installation will be performed automatically. Even you do not require to enter any license key. If you are facing some issue in upgrading or Installing F-Secure then you can simply use the Official Removal tool to uninstall F-Secure completely from your computer and do a fresh install. It will eliminates your most of troubles. If still have issue then contact directly to the F-secure Tech support customer care. Family protection with features like time limit, bed time, and content filtering to block unwanted websites. It’s now easier than ever to install F-secure since the process has been greatly simplified compared to past versions. No longer you have to scroll through different menus and click “Next” several times, as F-secure products can now be installed in one click. F-secure products make the required adjustments from the start and install by default in your C:/ drive. If you need further personalization options you can also use the “Custom” option and define what needs to be changed from there. Installation interface has also been improved for the purpose of appearing sleeker and more modern. In the previous versions of F-secure users with virus-infected computers had to go through the same process as users with regular computers. However, this is not available anymore for the newer version as the script of both Anti-virus and Internet security suite have been modified in such manner as to identify viruses which could possibly hijack product installation. Thus, a cleanup tool is automatically started prior the actual product installation for the purpose of identifying active malware in the computer. Additionally, an extensive computer scanning can be quickly performed once the product has finished installing. It needs to be said that F-secure feature a new protocol for downloading updates, one which greatly facilitates the process and enables a faster retrieval of virus definitions. Updates are downloaded automatically by default but the amount of network traffic required has been greatly reduced, hence the reason why even users with slow Internet connection can benefit from updates in a relatively short amount of time. Updates can still be performed from the main interface if desired. Promotions are great way to save some money on your antivirus purchase. F-secure also launch promotion schemes time to time. We bring you coupons first in the market to get benefit early. In home segment F-Secure provides antivirus and internet security products but they only support windows based desktops only. For multi device compatibility F-secure have launched a products named as F-Secure Safe. Actually it is internet security but with support for mac and smartphone along with Windows. F-secure Total is a pack consists for Safe, Freedome and Key products to provide overall protection. F-Secure also provides 2 free products Online scanner and Router checker. It is an old security company and is constantly upgrading their products to combat latest cyber threats. Its installation is really simple and is also very quick. License management with online account is also very user friendly.